Each turn, you will dig a new tunnel and claim a new prize. No guard is smart enough to catch you. Boundless riches are there for the taking, but it's not about the money. It's all about the bragging rights. Somebody is ripping off your idea. You can't confront them directly, but you can show them up by being the better thief. You're going for points, but you only gain points for the districts you are dominant in. 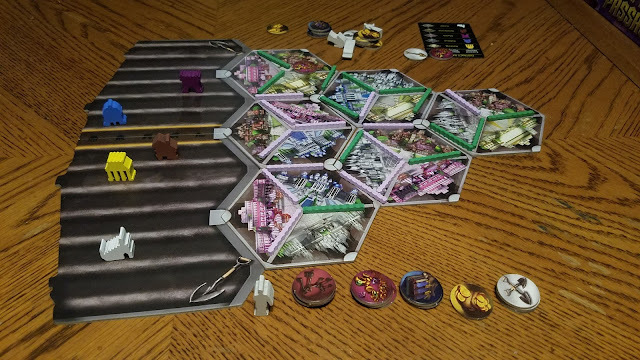 It's a different sort of area-control game with a complex, set-based scoring system. Place the five control markers in the center of the control track. 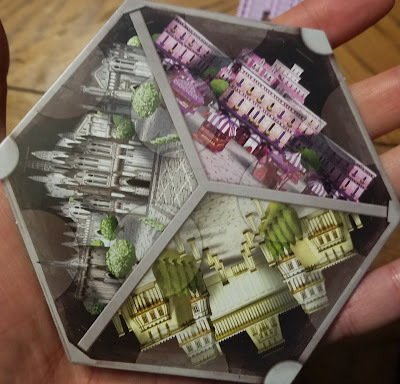 Then, randomly place treasure tokens on the 27 faint circles in-between the diamond-shaped building spaces. Place the four statues at the intersecting points in the center. Finally, draw three random Objective cards and place them by the Control track. Each player takes the pathways of their chosen color. The first player is determined randomly. The second player moves one control marker one space towards them. Now you're ready to play! The rules are simple and easy to teach. 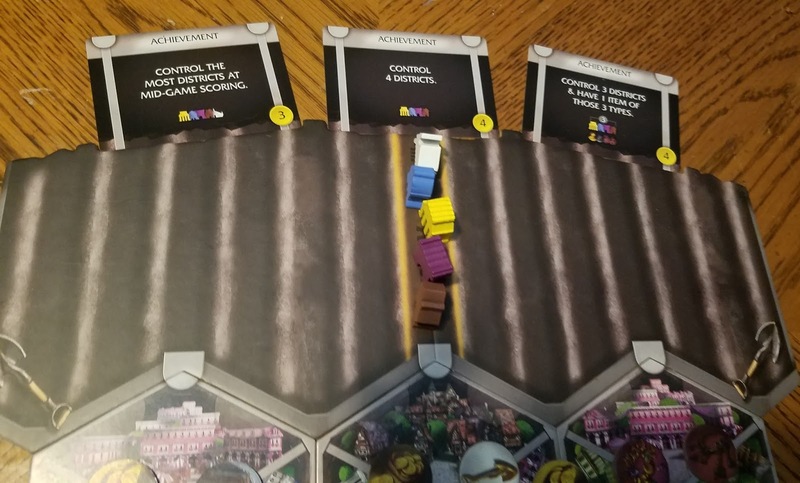 Each turn, you place one of your tunnel markers on a path between two of the colored buildings and take the token on it. Then, you will move the control markers that match the colors of those buildings one space closer to you. 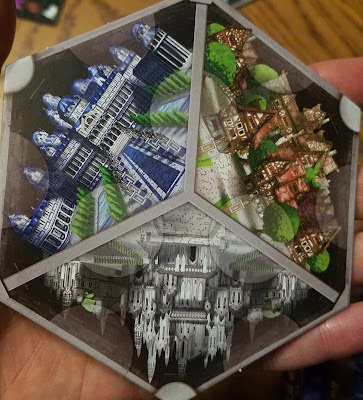 You're playing tug of war with five different districts, and only the player who controls a district gets the points associated with it during the scoring periods. 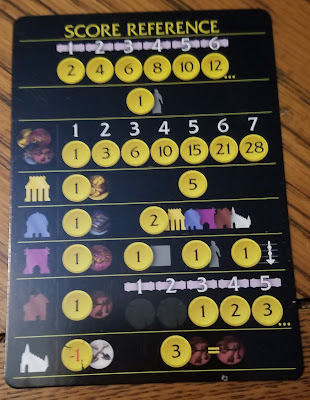 Scoring seems complicated at first, but the reference cards make it easy. During each of the two scoring periods, both players will score points for sets of tokens, stolen statues, and the length of their longest tunnel, but points alotted by districts only go to whichever player controls the control marker of that color (i.e., it's on your side of the control track). In the second scoring period, you will also count points on the Objective cards you've earned. Each Objective card is taken by the first player to meet its conditions. This is a very well-balanced game, so Objective cards will frequently determine the winner. 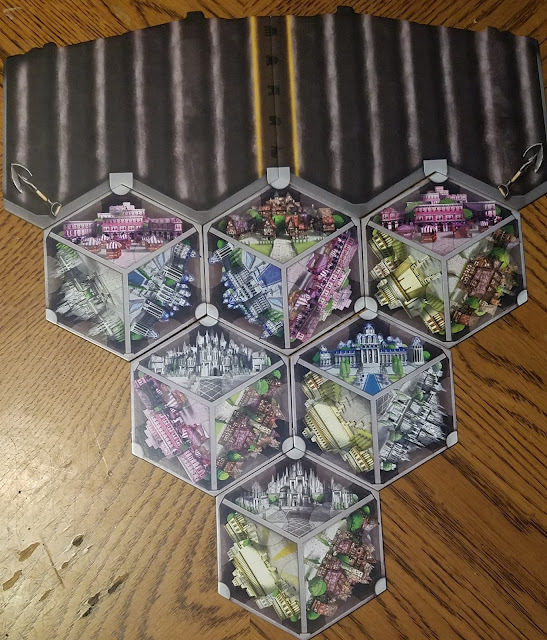 The rulebook is a short five pages, or for the more visual learners, you can pop over to YouTube for an episode of Watch it Played. This has a nice roguish feel. It's easy to get treasure, but you have to be crafty to gain control of the districts. It may not be direct confrontation, but there's plenty of passive-aggressive tactics available. You have to trip up your opponent while getting the treasure that will score you the most points. Do you benefit more from getting a big pile of the same coin for the exponential bonus, or from the Objective cards? Is it more important to shore up a district you control or try to make the other thief lose control in one of theirs? Yellow scores five points, plus one extra point for each of your gold tokens. Blue scores two points for each district you control, plus one extra point for each of your blue tokens. 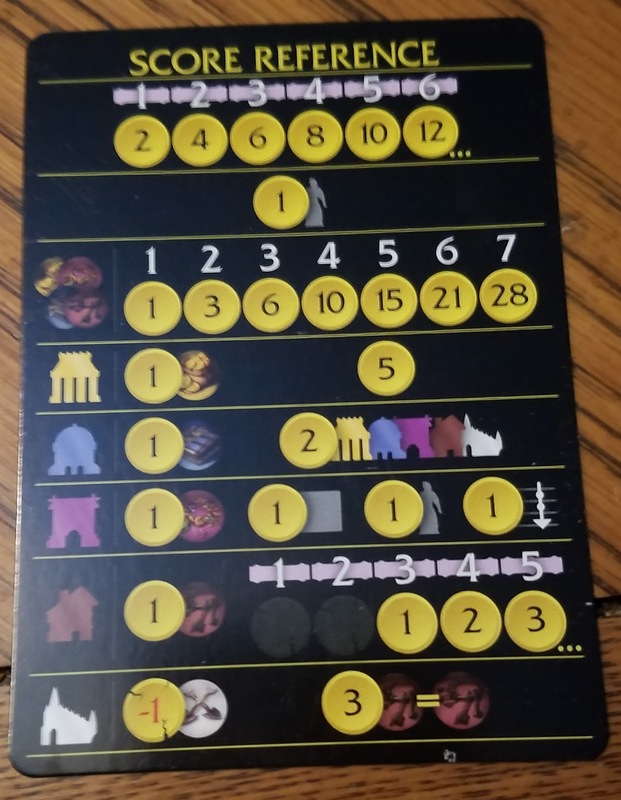 Purple scores extra points for each of your statues, purple tokens, objective cards, and one more for each of the spaces between it and the center line on the track (if it were on the fourth space, it would get four points). Brown raises the value of your longest road, plus scores one extra point for each of your brown tokens. White gives you three points for each set of matching tokens, but you lose a point for your shovel tokens. Four Statues stand in the center of the city. They are a bonus you get for placing a tunnel on the last path connecting to them. It doesn't matter if the other tunnels belong to the other player. They are each worth one point during the scoring period and one more point if you control the purple marker. There's also an objective associated with them. Most tokens you collect are treasures that score exponentially. Shovels actually give you negative points if you control the white marker, but they give you a very nice boost to your control. If you take a gold shovel, you get to move any control marker one space toward you in addition to the two you would typically get for placing a tunnel. 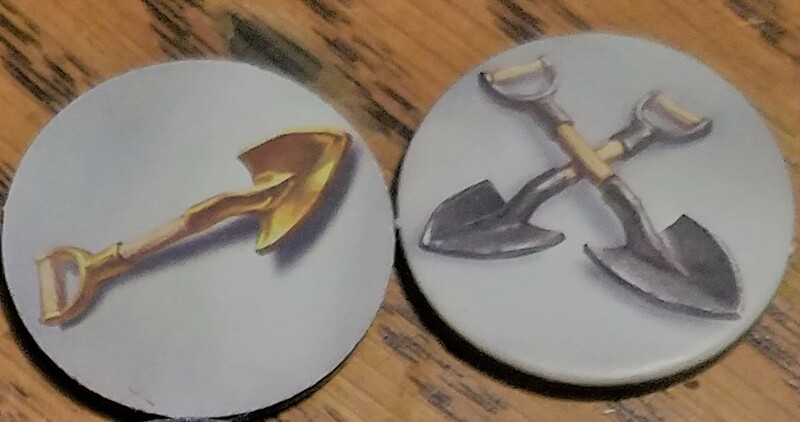 The two-shovel token only applies to the colors next to the new tunnel, but it moves the control markers two steps closer to you instead of one. If you placed between two districts of the same color, that would move one marker four spaces closer. 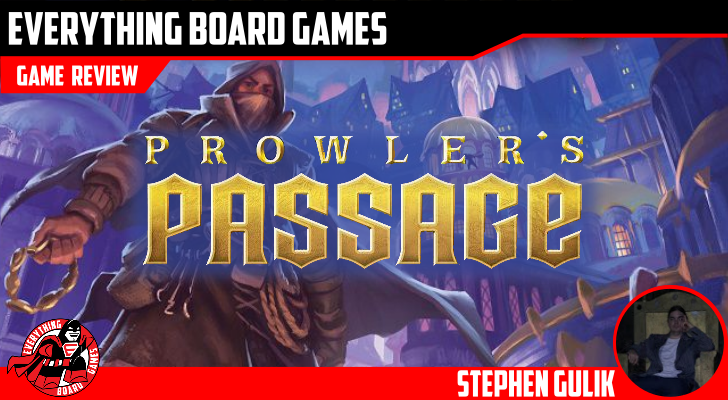 Prowler's Passage is a lot of fun. It plays really fast, and it's very well balanced. It's one of those that is hard to convey just how good it is. 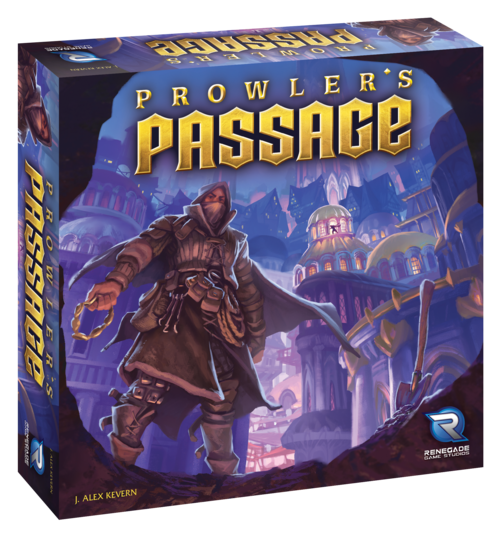 Renegade puts out great games, and J. Alex Kevern is a well-renowned designer. I had pretty high expectations after watching Rodney Smith's video, but I was still surprised just how good it was when I got it on the table. It feels a little like Five Tribes but with less AP, setup, and playtime. The tile artwork is gorgeous, but it could have benefited from a bit less subtlety. The circle spaces where you put the tokens are hard to see, and the colors are slightly more subtle than they should be. The result is a beautiful board that you sometimes have to look at very carefully to determine its colors. It's not noticeable until you see the whole thing set up. Even then, it's not too bad, and it's the only complaint I have. 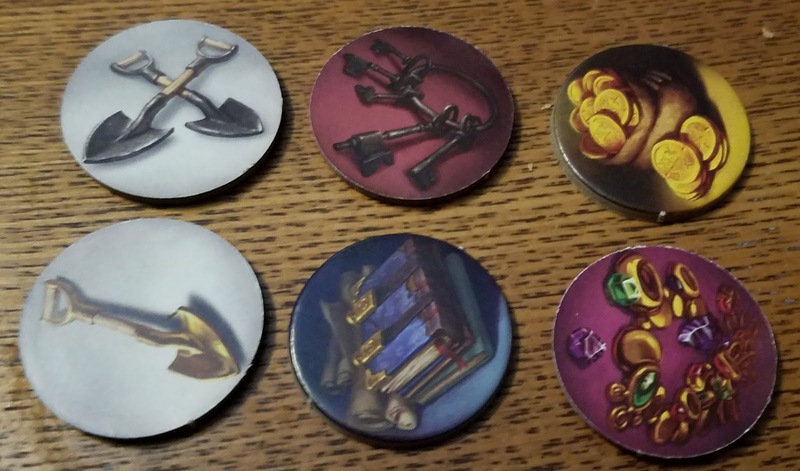 Like all Renegade games, the components are extremely high quality. 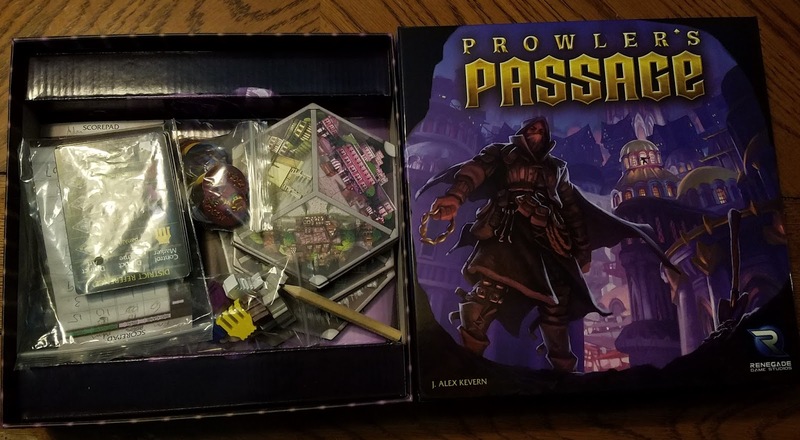 Prowler's Passage boasts thick cardboard that punches out perfectly, a sturdy box that fits all components snugly, high-quality cards, four unique statue meeples, a concise rulebook, custom score sheets, and even a little pencil to write on it. Renegade does not screw around with production quality. Fast to set up and play. Complex, well-balanced, and unique gameplay. Fun theme with beautiful art. A strategic, non-fighty two-player game. Excellent production quality. 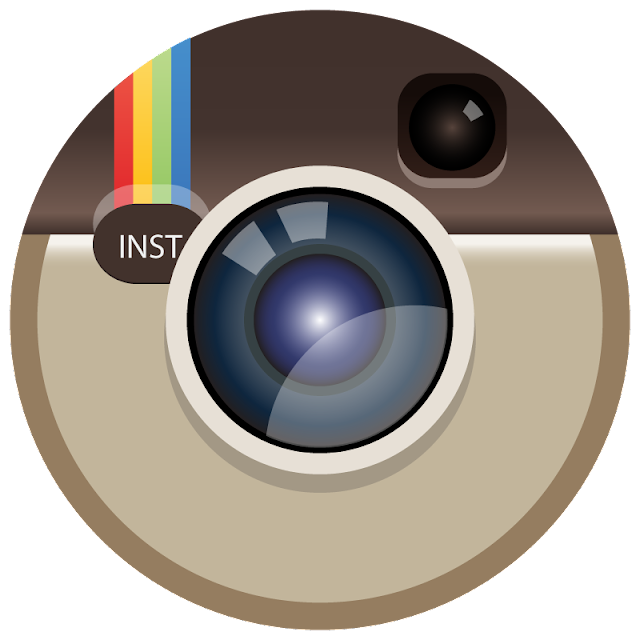 Colored spaces could be easier to differentiate. 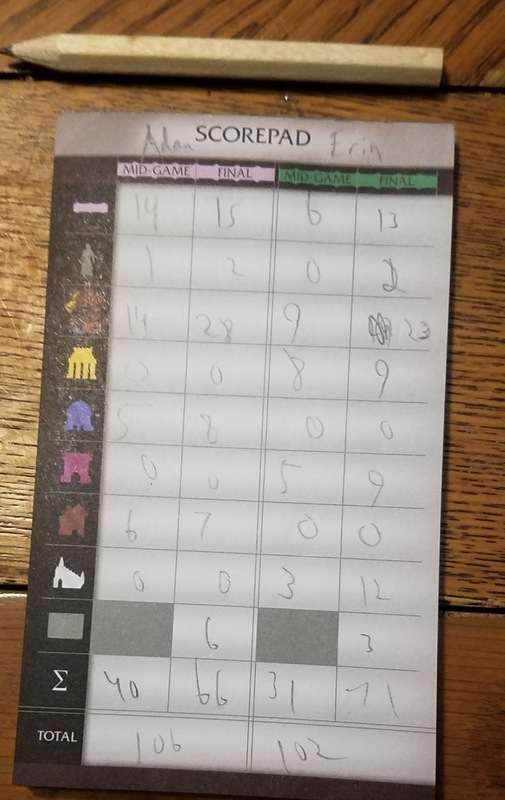 My wife and I have been looking for a good short game we can play after everybody else tags out, but it's hard to find something that plays well with two players that we both like. She hates most direct confrontation, and I'm not big on lighter games in general. I'm the guy who suggests Lisboa at 3 a.m. Prowler's Passage is that unicorn we've been hunting for years. It's fast, fun, and elegant. 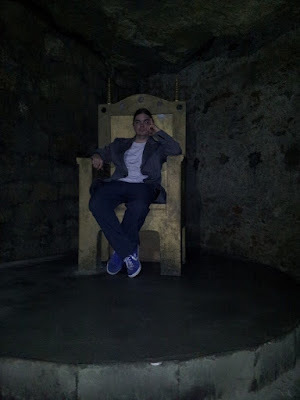 When we finish, I want to go again. I never do that. This is definitely one of the best short games I've ever played. 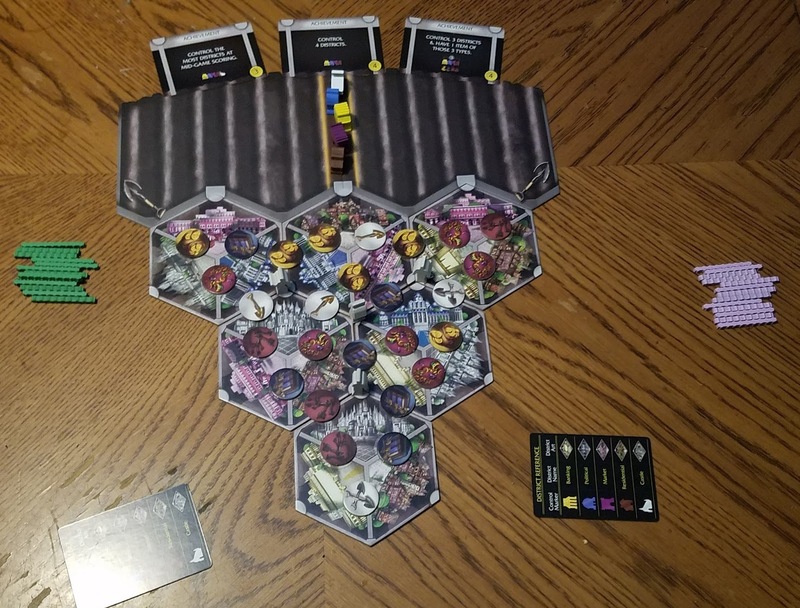 Heavy, light games with quick rounds and great complexity. The good kind of point-salad.